Is it possible that the bridges block the movement of AI units towards the objectives? In my test scenario AI units do not cross the bridge; if I replace the bridge with clear terrain, then they move towards the target. Status: offline No the bridge will not block the path for the AI units. AI will move across the bridge. You need to have some good VP objectives nicely placed or AI Special "Attack Hex" Commands for the units. Status: offline Thanks for the answer BUT the German units have AI Attitude = Advance and all are set "Attack x, y", BUT if there is a bridge they do not advance towards the target (Victory objective). What am I wrong? Here is the scenario file with the bridge. Status: offline Angiel the scenario works fine. The units moved as they should across the bridge the very first turn. Status: offline Test on Normal difficulty without Fog of War so you can see what is happening. Are you running the latest version of the game? Status: offline Just tested in v.1.1.20 at Very Hard level with no Fog of War and the German units moved exactly as they did in Paullus' test. I solved the problem ..... using the original counters the game works, using the Mod JMass Small_markers or JMass_TotH_VASL, the Germans do not advance towards the objectives. @ UP844 where can I find version v.1.1.20? v.1.1.20 is available for download HERE. I strongly doubt a graphics mod can affect unit behaviour. In the worst hypothesis, the terrain picture would not match the terrain type, but even this looks very unlikely, as bridges are road overlays. What terrain type appears in the upper right corner if you place the cursor on the bridge hexes? If you play with the Germans, can your units move through the bridge hexes? I have encountered 'graphics glitches' impacting unit movement behavior, yet, only in modified terrain sets. I had created some very heavily modified terrain sets to try out completely different looks, shading, and perhaps even have alternate terrain types in place of others [bearing in mind the TE] and have run into 'blocking issues' with some terrain types when I didn't have an exact edge match to original; particularly around water hexes. --With the Mods JMass_TotH_VASL_mod_v1.1 and JMass-Small_markers_Terrain_Originale -> Germans to the south DO NOT move, those to the north, yes. I can not understand why this happens. --What terrain type appears in the upper right corner if you place the cursor on the bridge hexes? 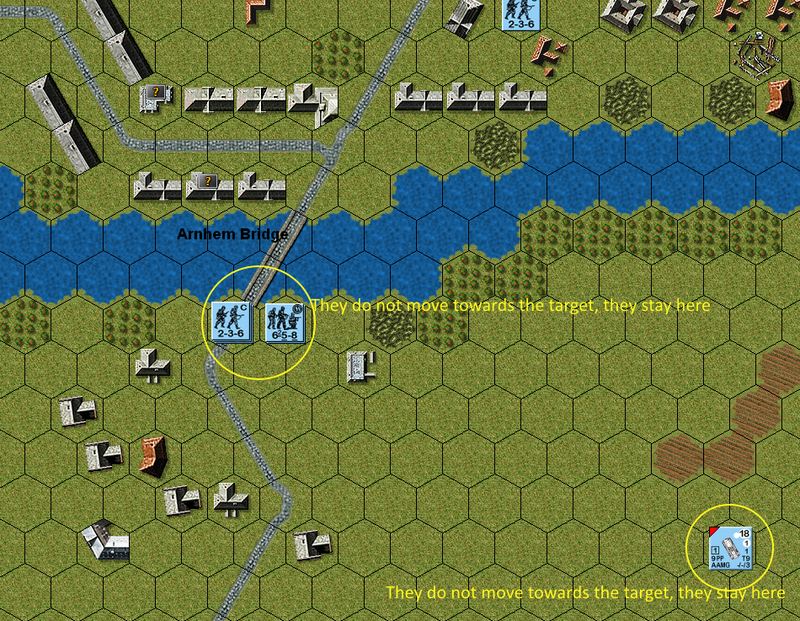 --If you play with the Germans, can your units move through the bridge hexes? I never thought a graphics mod could interfere with the AI, but both your post and technikzauberer's previous one prove this could happen. I still cannot see how changing a graphic file can affect the AI . It must be just like that. I'm so enjoying your labor of love! Status: offline I complained about several aspects of the AI behaviour , but I never noticed it not moving because it had no LOS to a VP hex . I complained about several aspects of the AI behaviour , but I never noticed it not moving because it had no LOS to a VP hex . AI doesn't need LOS to a VP, in order to move towards it. If the AI does not need a LOS to move towards a VP, how can unwanted LOS changes affect its behaviour? If AI units are moving towards an objective (regardless if the VPO is in LOS or not) and no human units are in LOS, then AI moves differently than when human units are in LOS (in which case AI might consider engaging some/all human units. Status: offline I am aware of this. The only British units in the scenario, however, are the ones shown in the screenshot attached to the initial post. Since they are much farther away than the VP hexes, I doubt the AI takes them into consideration. Moreover, it would have to close with them to come into range (and to cross the river, unless it intends to fire at the southernmost British stack from the south bank). In any case, the units on the south bank should have to move, but - as Angiel reported - they remain stationary. I was thinking about the possibility that the bridge overlay has a wrong alpha channel - in the sole graphic mod that causes problems - not matching the road. The two bridge hexes are oriented from SW to NE (/). If the alpha channel is oriented in any other different way, i.e. SE to NW (\), or E to W (-) the two hexes are not connected and so the units on the south bank have no path to reach the VP hexes. As a consequence, they won't move. Can you check - in Photoshop or in a similar graphics software - if the alpha channel in the mod causing the issue? Do other bridge hexes cause similar problems? Status: offline I was thinking of checking it out... but out of all the terrain mods out there, [I must be brain dead from all the cold meds] which ones are JMass_TotH_VASL_mod_v1.1 and JMass-Small_markers_Terrain_Originale? I checked, the bridge's alpha channel has no problems. BUT I replaced a part of the JMass Mod terrain with a part of original terrain and the south units move. Status: offline That's a step forward: at least now we have a rough idea of where the cause lies. I have tried copying the default terrain as a second layer over the JMS terrain. The upper portion of the JMS terrain (the one you replaced) appears to be shifted upwards by a single pixel, even though this is the only difference I manage to detect (I might have missed something else). In the image below I have set the transparency of the default terrain to 30% and the two images clearly do not match. I have no clear idea as to why this affects the AI behaviour: my best guess is that the shift makes the road not- functional and so the river hexes remain impassable. You could test this by moving a unit along a road and by checking if it gains the +1 hex bonus. Status: offline Unfortunately, the PSD file is too large to be attached here (25 MB), even in ZIP format (15 MB).